"During an unfortunate series of events, a friend of Kung Fury is assassinated by the most dangerous kung fu master criminal of all time, Adolf Hitler, a.k.a. Kung Fuhrer. Kung Fury decides to travel back in time to Nazi Germany in order to kill Hitler and end the Nazi empire once and for all." Normally I would never copy and paste a plot synopsis, but I couldn't possibly say it better nor could I sell the product that is Kung Fury anymore than the words above will. If you read that and have no interest, you won't enjoy it. If the idea of Adolf Hitler being the greatest kung fu master of all time colors you intrigued like it did me, than hitch a ride to the Kung Fury train. You won't be disappointed. Before you go and watch it though, and you can on Youtube right now if you are so inclined, let me make one thing clear: you are not allowed to use the words "stupid" or "silly" as a detraction of what the film accomplishes after you are done. 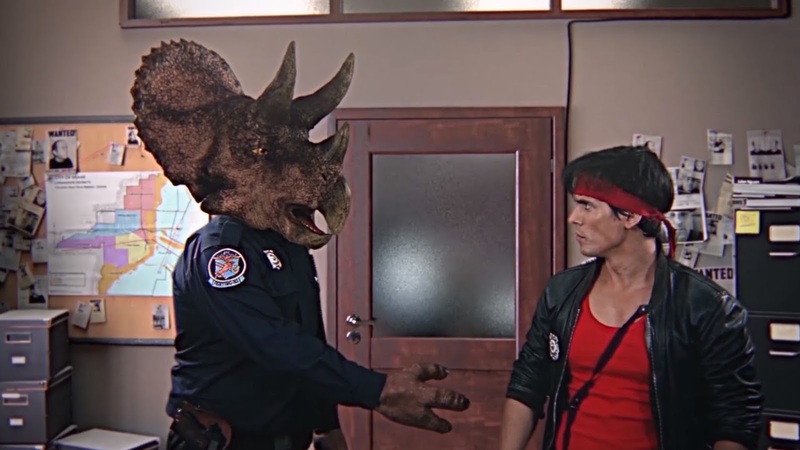 You can and should use those words, because it is ridiculously stupid and silly, but Kung Fury is so obviously self aware of its stupidity and silliness that it is actually a compliment to point it out. All it wants to do is be stupid and silly and have fun, and by doing so it actually becomes apparent just how smart the film is. It's mockery of the cheesiness of 80's television and cinema is glaringly obvious but it is done with such a clever grasp of how to do it in an entertaining fashion, it deserves to be applauded. It is a tight 30 minute short film, and thank goodness for that because the joke never has a chance to get old as it certainly would if it were double or triple the length. It's a laugh out loud satire that had me so gleefully enthused when it ended, I would gladly go back and watch it again and again. In fact, I will. I'm gonna watch Kung Fury again tonight, and it's gonna be friggin' awesome. My only complaint is that the effects are too good in places. They need to make the effects look more dated.